The stunning fluted double gourd design provides this contemporary table lamp a traditional aesthetic. 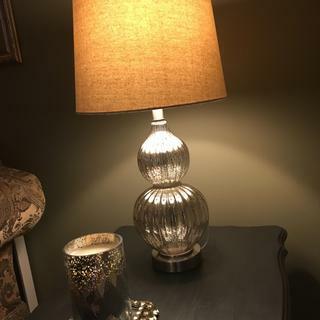 An elegant accent for your decor, this mercury glass table lamp sits on a round base. The cool silver tones in the body are complemented by the warm color in the drum shade. Overall: 25" high. Base is 4 1/2" wide. Shade is 11" across the top x 13" across the bottom x 9" high. Takes one maximum 100 watt bulb (not included); on-off socket switch. Mercury glass table lamp from the Regency Hill brand. Fluted, double gourd base with brushed steel finish pedestal. Beige tapered drum lamp shade with decorative finial up top. 9 1/2-foot clear cord. To match another lamp that was broken. Unfortunately, it no longer comes in gold so I bought two in silver. Matches nicely with my new bedroom set. Good looking, Seems good for reading. 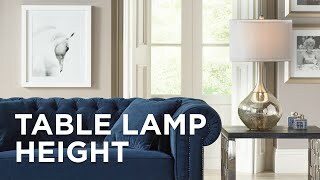 I pick this lamp because last week we bought 2 others that arrived yesterday for bedroom from Lamps plus and we are satisfied with them and service and this lamp looks like it will complement others . Nice design. Love the color of the lampshade. It was a great price on sale! Blends silver/gray tones with tan/warm tones, compliments new living rm furniture which combine grays and tans. Like mercury glass! 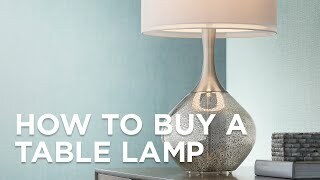 Fluted base is similar to two table lamps I already own. 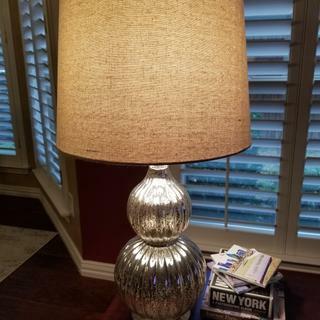 Do you have a white shade same style as this one I can purchase with this lamp ? 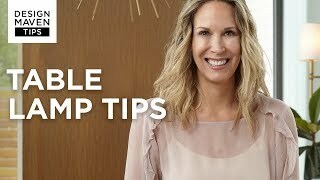 BEST ANSWER: Hi - I have added some lamp shade options below that are close in size that you may purchase separately. Does this lamp take regular/standard light bulbs or the newer weird looking light bulbs? BEST ANSWER: Hi - you can use regular standard base incandescent light bulbs with a maximum of 100 watts. You may also use LED, fluorescent and halogen light bulbs. I have a CFL bulb in my lamp because they seem to last forever but I'm sure the lamp will take any bulb with the proper base. Do you have a lamp like this with Gold accents & hardware? BEST ANSWER: The only mercury glass table lamp with gold accents is the one picture below. Is this with USB port? Does the height include with the shade on or just the base? BEST ANSWER: The height includes the base and shade. It is the height of the lamp plus shade. Nice lamps, very good price. THE VALUE ON THIS LAMP CAN'T BE BEAT. I HIGHLY RECOMMEND IT. 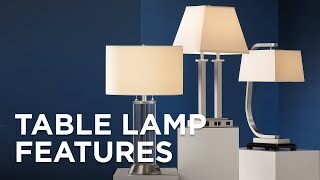 I absolutely love these lamps using them on night stands. Nice lamp at a good price. I bought these lamps to use in the master bedroom at our farm. I love their look and the light they put out, but was a little disappointed that they were so light in weight. Cons: Lamp does not have much weight to it. LOVE it! Worked perfectly on a end table in my family room to give it an updated look! Love, Love my new lamps. They are so updated and pretty! The glass is almost a gold/silver hue as the silver meshes through it and bounces off the shade when lit. I have bought a few lamps from Lamps Plus and I have NEVER been disappointed. Quality and packing superb! Perfect in my bedroom. So happy with them and they were well priced. This lamp is beautiful. Very happy with this purchase and customer service is outstanding. These lamps are perfect in our bedroom. They add just the right amount of sparkle. Beautiful! Look lovely on the end tables! This lamp was what we were looking for. Neutral colors fit. Perfect. It was in stock at the store and we brought it home. I ordered two for my bedroom, and they are the perfect size beside the bed. They were safely packed for shipping, and easy to put together. They compliment the silver frame above the bed and look lovely. I am so pleased with these lamps! Beautiful lamp! Great quality and price....I love it!! Beautiful lamps and quick shillings. These are so beautiful. For some reason they are a bit smaller than expected but also much prettier! Shipping was quick and they were packaged really well. Do not hesitate to purchase these. Stylish lamp that works well bedside and complements a variety of contemporary decors. Lamps look great and work well.